if you bend reality, you might imagine it was the composer himself. This concerto has three delightful movements and was first performed in March of 1784 in Vienna. It is regarded as Mozart’s first mature work in his brief career. Most of the concerts given by Mozart in Vienna were in private homes of the upper class. However, the popularity of the music spread to the bourgeoisie and somewhat public musical salons. The third movement, Allegro ma non troppo is my favorite. Allegro ma non troppo means play fast but not too fast. In Italian, “allegro” means joyful. Margaret Batjer (concertmaster), the composer shared his impetus for composing the piece. Howard, completing a tour abroad returns to Los Angeles to the tragic fires in Malibu, the noise on the news, pundits screaming at each other and a world in turmoil. The dynamic piece expresses Howard’s perspicacious understanding of using music as a means to heal the listener. The limpid movements were expressive and deeply moving, creating sounds from the cello that were quite beautiful. Howard’s forte in composing music for films is reminiscent in the concerto, but it holds its own as a significant orchestra concerto. James Newton Howard’s career spans over thirty years. He has composed music for over 120 films, including the Academy Award-nominated scores for Defiance, Michael Clayton, The Village, The Fugitive, The Prince of Tides, and My Best Friend’s Wedding, and Academy Award-nominated songs for Junior and One Fine Day. This dark piece is perfect for the innate sonorous sound of the cello and was written for and spotlights principal cellist Andrew Shulman. 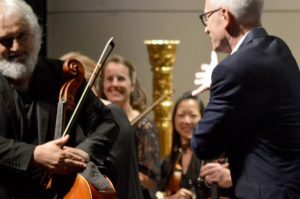 Shulman played with emotion expressing all the nuances of the piece – creating sounds of tears by the cello. Shulman, a soloist, recitalist, chamber musician, conductor, composer and teacher was made an Honorary RCM (Royal College of Music) by HRH The Queen Mother. He is the winner of the Piatigorsky Artist Award from New England Conservatory. Next on the program is the up-and-coming composer Gabriella Smith’s joyous Riprap for Marimba and Strings. An interesting and ancient instrument; the marimba is a percussion instrument consisting of a set of wooden bars struck with yarn or rubber mallets to produce musical tones. The origins of the marimba are Guatemala, Mexico, Costa Rica, Nicaragua, Honduras and West Africa. Resonators or pipes suspended underneath the bars amplify their sound. LACO’s principal percussion Wade Culbreath plays energetically in this exciting piece. Kahane closes with Mozart’s Symphony No. 36, “Linz” named for the city where Mozart, ingeniously wrote the symphony in three days. It is unbelievable that he composed this gorgeous 26-minute symphony so quickly as its complexity belies the speediness in which it was created. Bravo LACO! Once again demonstrating it is truly one of the best chamber orchestras in the country. 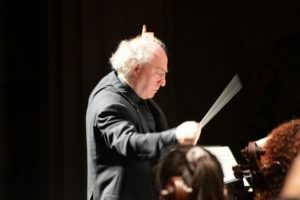 This concert was on March 24,2019 at Royce Hall. For more information on this and upcoming events visit LACO.